Many types of wood that were once abundant are becoming increasingly difficult to find. Sadly, some, like the American chestnut, are essentially extinct, to all extents and purposes, and are unavailable for commercial use, at least from natural sources. While it is saddening to think about the loss of valuable types of wood around the world, homeowners are not left without choices. Those searching for more exotic varieties might have better luck finding what they’re looking for by searching for reclaimed wood. Reclaimed lumber can come from a variety of sources, but the most common is reclaimed from old building such as barns, factories, and warehouses. These sites provide great locations for reclamation because they generally provide wood in sizable pieces, which makes it more flexible in terms of its’ potential future applications. Using reclaimed timber is a great alternative for many reasons. First and foremost, we must acknowledge that we live in a world with a finite and diminishing amount of natural resources. Over-aggressive deforestation efforts are causing unforeseen and unpredictable consequences. By choosing to use reclaimed wood, you are helping to preserve our world’s precious forests by reducing the demand for what is commonly known as “virgin” timber. Processing reclaimed wood has less environmental impact than felling, transporting, and processing brand new lumber. Interesting, the varieties recovered can actually include those that can’t be found naturally. Because reclaimed timber is often taken from older structures or vessels, the wood often came from more mature trees. This means that the reclaimed timber can be processed in much larger planks that trees grown commercially. In addition, wood from mature trees is stronger and, therefore, less prone to splitting under adverse conditions. Because reclaimed wood is exceptionally old, it has already completed dried out, which makes it more durable and less likely to warp as well. Reclaimed wood from old buildings or ships is also, generally more stable than “virgin” timber. This is largely because older wood tends to have a denser grain. When looking at reclaimed wood, one of its’ most distinguishing aspects is its’ character. Every section has a story, often spanning hundreds of years, and no two pieces are identical, which gives incredible depth and unique character to anything fashioned from reclaimed wood. 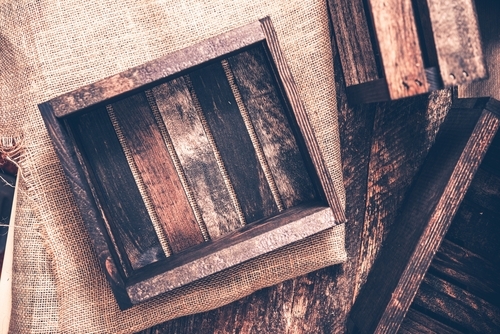 While reclaimed wood has its’ benefits, it certainly has a few negatives as well. While the wood’s unique history, which, in part, gives it its’ distinct character, can be one of its’ greatest qualities, it can also prove to be problematic for those seeking a uniform appearance for flooring or furniture made from the wood. Some reclaimed wood can also have scars and indentations as a result of the removal of old nails. While some people will appreciate the character of these marks, others will only view them as flaws. If cost is your concern, you should know that this wood can be more expensive than “virgin” timber due to the costs of dismantling, sorting, and preparing the wood. Presently, reclaimed wood provides a great source of reliable, environmentally friendly material for producing furniture, flooring, and other architectural features. We must remember, however, that, like most things on this earth, reclaimed wood is a finite resource, and it will not be around forever if we are not frugal in our use.